Well-known guitar brands stay on top for good reason. These manufacturers have established their brands over the years by producing high-quality guitars made of durable and high quality materials that make their guitars a popular choice by many. Christian Frederick Martin established this US guitar brand in 1833. The Martin brand is revered for its steel-string guitars and is the leading manufacturer of flat top guitars. A well-known innovation brought about by the Martin brand is the popular Dreadnought guitar body style and scalloped bracing. Martin also pioneered the fourteen-fret guitars where the guitar’s neck joint falls at the 14th fret instead of the 12th which was commonly done back in the days. These guitars were designed to be played with a pick and used in jazz orchestras, thus earning the name Orchestra Model (OM). The OM features, the most versatile combination in a steel-string guitar, are: the modified 14-fret body, long scale neck of 25.4”, solid headstock, 1-3/4″ nut width, 4-1/8″ maximum depth at the end wedge, and 2-3/8″ string spread at the bridge. Another major innovation led by the Martin group is the Dreadnought design which offers a greater volume and louder based due to the guitar body’s expansion in size designed to be used as an accompaniment instrument for singers. The dreadnought with the X-bracing was then modified in the 1930s to accommodate the 14-fret neck which became the company’s bestselling guitar model. Today, the dreadnought is considered as one of the standard acoustic guitar shape suitable for various musical genres. 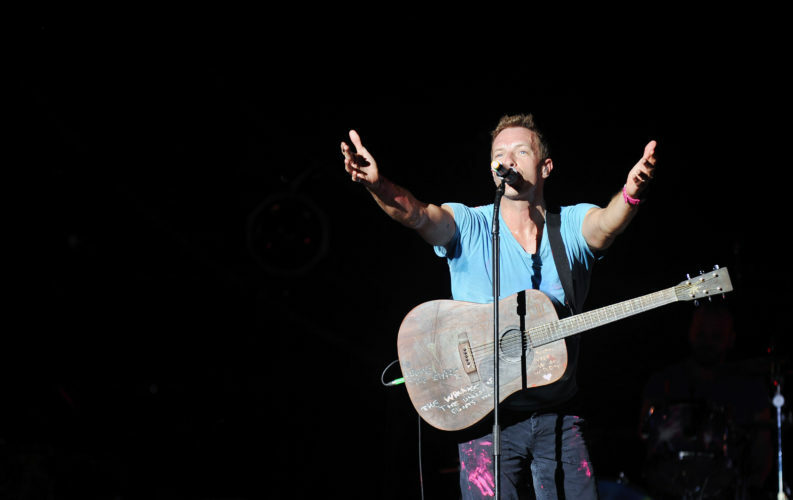 Singer Chris Martin of famous British band Coldplay using a Martin guitar during a performance. The Taylor brand is the leading acoustic guitar manufacturer in the United States. It was founded by Bob Taylor and Kurt Listug in 1974. Taylor is known for its pallet guitars that used exotic tone woods, specifically oak, for its construction in 2000. The limited edition Pallet Guitars were sold to collectors. Taylor guitars have also patented bolt-on necks known as the NT (New Technology) neck. What makes it different from most guitars is that the NT neck utilizes one continuous piece of wood all the way to the 19th fret to act as the fretboard’s support. Commonly, a guitar’s neck is constructed to support the fretboard until the 14th fret while the rest is glued to the soundboard. Taylor swift uses a Taylor guitar. If your name is Taylor I guess you kind of have to invest in a Taylor guitar! In 1902, Orville Gibson founded the company. The Gibson brand is popular for its “Les Paul” guitar introduced during the early 1950s. Early modernizations also included the Thinline series of thinner guitars and other eccentric-looking designs like the Explorer and Flying V.
Aside from manufacturing guitars under the Gibson name, the company also owns and manufactures instruments under various brands such as Epiphone, Kramer, Steinberger, Maestro and more. Copies of their most successful guitars are authorized by Gibson to be manufactured under these brands to produce similar but less expensive guitars compared to ones with the Gibson name on it. This Japanese guitar manufacturer is popular for its steel-string acoustic guitars. Founded in the 1960s, the Takamine company is among the companies who first introduced the acoustic-electric guitar models. They were the pioneers in the preamplifier-equalizer design. Takamine acoustic guitar models feature asymmetrical neck profiles for improved playability because it was designed to fit the natural shape of the hand to form an asymmetrical letter C. It also features a pinless bridge to make changing strings easier and faster. One distinct feature this brand offers is the split-saddle bridge. This design aims to provide the accurate and enhanced overall intonation for the B string and the high E string. Takamine guitars are made of various woods, each carefully crafted and thought of to complement each other.